Nowadays, chatting and texting from mobile phones are out of fashion. People’s are now very much interested to do chat through the services like Facebook messenger, Gtalk, What’s app etc. Actually they are providing free chatting services. But there will be some friends who do not use these services, at that time you are forced to chat with them through your mobile phone. So, at that time just in case, your phone do not respond or the touch screen gives problem you end up helpless and stuck by having no other option to text your friends. At that situation, the android app called Mighty text will help you. It allows you to connect your PC or laptop to your android mobile phone and will text you to send texts using your network provider but through your laptop or PC. This app will be very useful for the person who want to chat with the friends who do not use internet much or have a group chat with friends who are not online at the moment. 1. If you want to use this app in your android mobile then first of all you need to download and install the mighty text app from Google Play Store. It is absolutely free. 2. So, once you downloaded then install the same by following the steps: Accept the terms and conditions, then you will be asked to enter your mobile phone number and G.mail id to confirm the linking of your device with the app. 3. Once you entered your mobile number then they will sent a confirmatory message to your mail id which you have given while registration. 4. This mail will contain links directing you to app stores of various browsers like Google chrome, safari, Firefox etc letting you download extensions to your browser by creating a shortcut in your browser toolbar. 5. Click on the link to the browser which you use and install the plugin or extension in your browser which will appear as a small icon in your browser toolbar. 6. 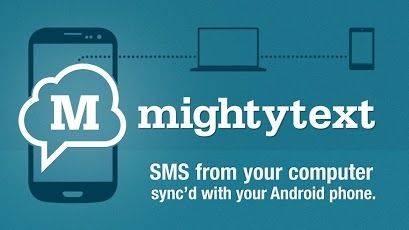 Right click on the icon and you will be getting option to launch mighty text extension to send and receive text messages on clicking the link you will be directed to mighty text app page which will show all your text messages in your phone in your PC or Laptop. 7. You will be seeing the Classic layout of Mighty text app page but if you want the more advanced version you need to click on the black box beside your message box to go to PowerView by Mighty text which is for frequent text users. 8. Power View is a very beautiful layout where all your messages will be laid out based on numbers as seen in the image and you can easily send and text if you are chatting with many people at the same time and the advantage is that you can type considerably faster from your manual keyboard compared to your mobile phones tiny keyboard. 9. For sending a new message or group message you have to click on the new SMS icon on the left side panel of the app page, which will launch a pop up in the right hand side lower corner of the page you can enter as many numbers as you can and send messages hassle free. 10. Remember that you don’t get confused that this is free and that you are using your mobile phone offer and your network provider will charge if you cross the limit of SMS. 11. Another interesting advantage of this app is it shows your android phone battery percentage which you can keep an eye on from your laptop or PC which is really helpful and a very nice feature.